The Fact Music Awards (TMA) will be held on April 24! TMA, Star, and fan in one place. [The Fact] "THE FACT MUSIC AWARDS", a music awards ceremony for "Star and Fan," will be held on this coming spring. "The official name of the first offline award ceremony for 'FAN N STAR' which consists of global K-pop stars and fans, has been confirmed as 'The Fact Music Awards'," the organizing committee of 'The Fact Music Awards' said in an official press release on 11th of this month. The "The Fact Music Awards," expanded and reformed the online year end awards ceremony of "FAN N STAR," which is decided by the vote of fans, will be the only festival held by the stars and fans in Korea. The online general media The Fact held their first online year end awards ceremony in 2015 through the idol ranking information website FAN N STAR, and successfully completed the awards ceremony in 2016 and 2017. 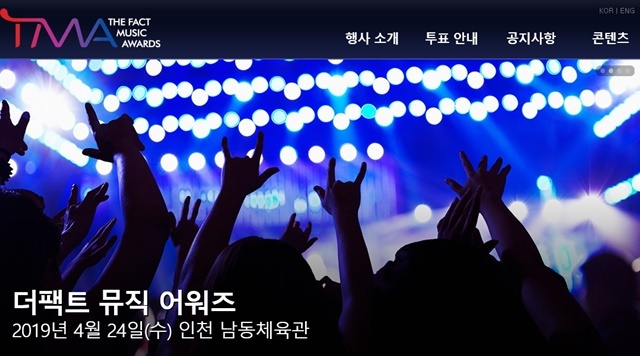 The new award ceremony, which will be launched this year with the official title of the "The Fact Music Awards," is expected to emerge as a new type of award ceremony where fans and stars communicate and share with, not just about awards. In addition, the official website of the "The Fact Music Awards" was also opened on the 8th, and information on the award ceremony, including artist line up and ticket distribution, and the timing of the event, will be released on the website as soon as possible.